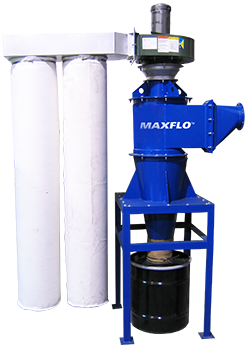 MAXCLONE cyclone dust collectors use centrifugal energy to separate large and medium size particles from the air. The spiraling effect brings those particles toward the bottom of the cyclone and into a dust storage system (drum/canister or other). Clean air is then drawn upward into the inner cylinder and discharged into the atmosphere or into an after filter system for additional filtration efficiency. Clean air can then be recycled back into the facility for maximum energy savings. The narrow footprint of the MAXCLONE allows interior installation without losing valuable floor space. Five questions to ask when considering a cyclone dust collector.